Hanoi (VNA) – State budget revenues amounted to 821 trillion VND (36.5 billion USD) in the first ten months of 2016, a year-on-year rise of 6.1 percent. The figure accounted for 80.9 percent of the annual estimate, according to the Ministry of Finance. 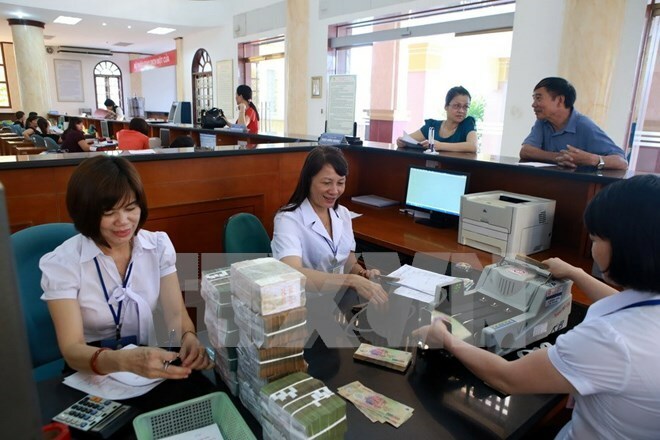 Domestic collection reached 663 trillion VND (29.47 billion USD), making up 84.5 percent of the yearly target and representing a year-on-year increase of 13.3 percent. Main contributors include the non-State industry and trade sector (up 19.6 percent), and foreign invested businesses (up 16 percent). However, revenues collected from State-run enterprises only reached 68.8 percent of the estimate, down 1.8 percent over the same period last year. The finance ministry pointed to difficulties in manufacturing and trade activities in several sectors such as mining, oil and gas processing, hydropower, and coal. Budget collection from crude oil in the 10-month period was recorded at 32.46 trillion VND (1.44 billion USD), equal to 59.6 percent of the annual estimate, down 42.4 percent. Import-export activities contributed 215.76 trillion VND (9.59 billion USD) to the State budget, fulfilling 79.9 percent of the yearly goal, posting a year-on-year rise of 3.3 percent. Meanwhile, budget expense in January – October totaled 980.5 trillion VND (43.59 billion USD), meeting 77 percent of the annual target, up 6.9 percent year-on-year. The ten-month State budget overspending stood at 159.5 trillion VND (7.09 billion USD), equal to around 62.8 percent of the National Assembly’s set target. As of October 2016, 51 businesses had their equitisation plans approved. In January – October, groups, companies and units divested 3.3 trillion VND (147 million USD) in five sensitive fields and collected 6.4 trillion VND (285 million USD). In the remaining months of this year, the Ministry of Finance will continuously operate the central budget, revise and supplement regulations on tax management, and speed up the disbursement of public investment capital.